Castleford head coach Daryl Powell has indicated that Justin Carney's behaviour was behind the winger's acrimonious departure from the club. The Australian, 27, was suspended by the Tigers at the end of last season and made this season's loan move to Salford permanent on Monday. "Justin's found a new club and it's best for both parties," said Powell. "There are certain things that you can accept in a rugby league club and certain things that you can't." He added: "There is a lot of truth and honesty in rugby league and that's the most important thing for me." Carney, who scored 63 tries in 62 appearances for the Tigers, accepted responsibility for the actions that led to him leaving the Jungle in an interview during pre-season, in which he also expressed his desire to make a fresh start. "Justin has said he was wrong - and yeah, you're dead set right he was wrong, in every single way - so people take their punishment and move on. 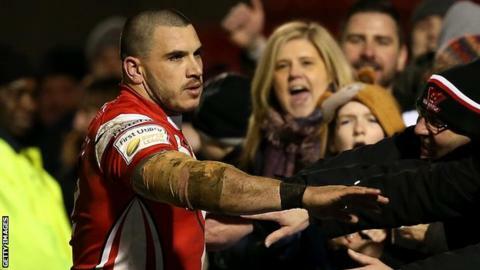 It's important he did that," said Powell, who also told BBC Sport that Salford were were the only club to express an interest in signing Carney. "It was a rough thing to go through but it is done now and we move on. It was a difficult situation but I thought we dealt with it impeccably in my mind. "I think it's really important now that everybody just moves on and we get on with the job of playing rugby league." Castleford are due to host Salford in a Challenge Cup sixth-round tie on 7 May. "We need to come out on top of that game," said Powell. "The most important thing for me now is what we have got in front of us. We've got to move on from this."